Our universe may have suddenly inflated from a tiny point during the Big Bang (now estimated to have occurred around 13.7 billion years ago -- more) to create dark energy (74 percent) and dark matter (22 percent), as well as a small amount (four percent) of ordinary matter in the form of electrons and quarks in a superhot plasma (more on the proportion of matter in the "Cinderella Universe" model from SDSS). Small clouds of dark matter have been coalescing and gradually merging together through gravitational attraction ever since that incredible explosion. Although dark matter makes up as much as 85 percent of all the matter in the universe, astronomers do not actually know what it is composed of (see a discussion of candidates). When a sufficient amount of dark matter has gathered, it attracts ordinary matter (mostly hydrogen and helium gas) to form stars that may eventually form a luminous galaxy at the core. 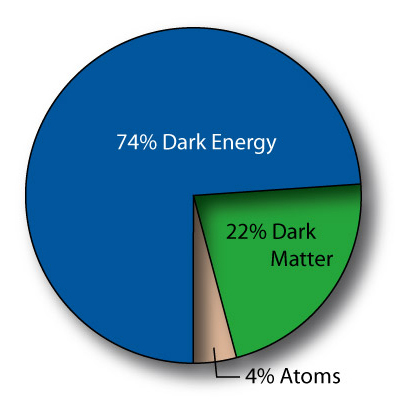 While particles of ordinary matter readily interact with one another and, if electrically charged, with electromagnetic radiation, dark matter is comprised of particles that do not react with such radiation, although dark matter interacts gravitationally just like ordinary matter (Christopher J. Conselice, 2007). On January 7, 2007, a team of astronomers announced that they had used observations obtained with the Hubble Space Telescope to create a three-dimensional map of the large-scale distribution of dark matter in part of the universe. 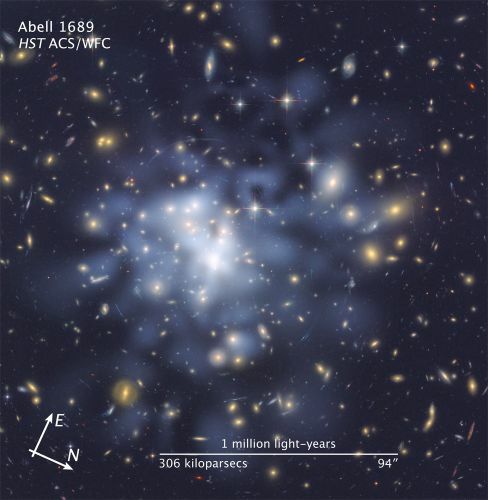 This map provides the best evidence to date that normal matter, largely in the form of galaxies, accumulates along the densest concentrations of dark matter. It depicts a loose network of dark-matter filaments that grew over time and intersect in massive structures at the locations of clusters of galaxies. 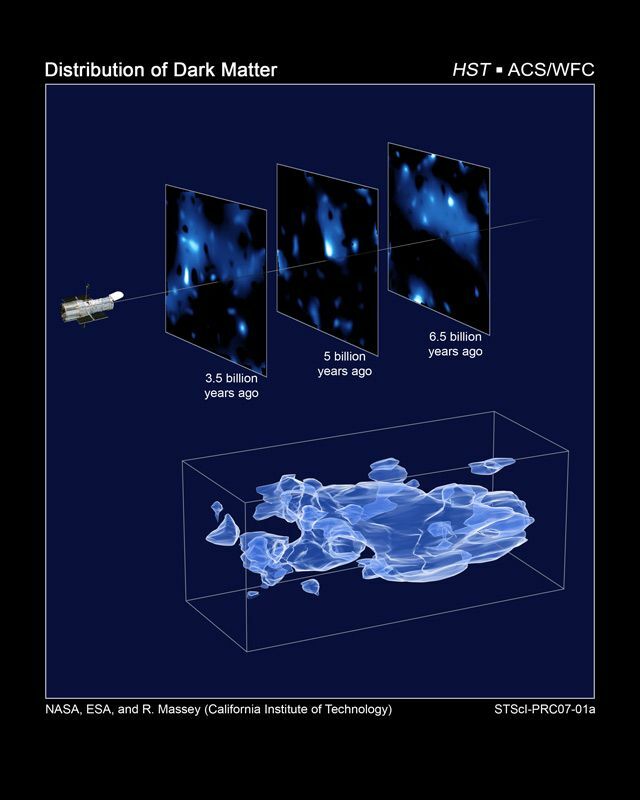 Stretching halfway back in time to the beginning of the universe, the map shows how dark matter has grown increasingly "clumpy" as it collapses under gravity. The map supports theories of how structure developed in the evolving universe, which has transitioned from a comparatively smooth distribution of matter at the time of the Big Bang. Dark matter filaments began to form first and so provided an underlying scaffolding for the subsequent development of stars and galaxies from ordinary matter (more). The presence of dark matter around the Milky Way was first detected by its gravitational effect on the galaxy's rotation curve, the orbital velocity of the observable stars or gas clouds in orbit around the galactic core. Astronomer Vera Cooper Rubin found over decades of radio observations that the rotational velocity of clouds of ionized hydrogen (HII regions) in spiral galaxies like the Milky Way was not decreasing at increasing distance from their galactic cores, like the velocity of the planets around the Sun. Rubin's finding of relatively flat rotation curves far beyond the reach of the visible matter of galaxies is believed to be possible only if the observed galaxies have large amounts of non-luminous mass in their extended haloes (more on Vera Rubin and Dark Matter). around 2.2 billion light-years away (more). 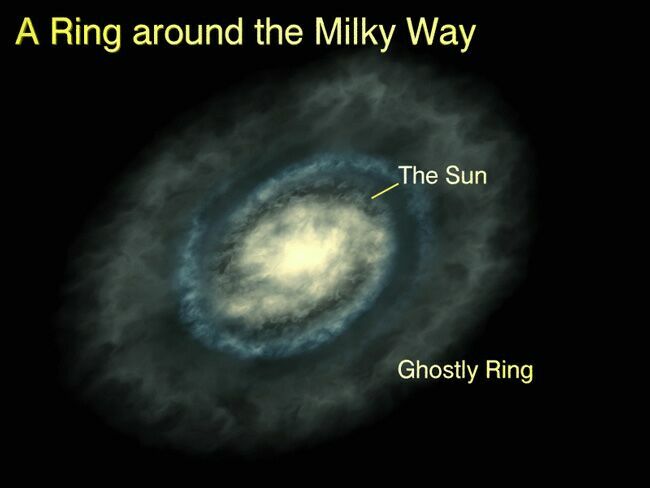 The Milky Way's dark halo is believed to outweigh the galaxy's normal matter by around a factor of 20. While the inner edge of the luminous hypothesized outer ring that surrounds the spiral disk of the Milky Way may be around 120,000 light-years (ly) across, the dark halo encompasses and permeates even the enormous luminous halo of scattered individual stars and globular clusters, extending some 300,000 to 400,000 ly out from the galactic center in radius (twice that in diameter). 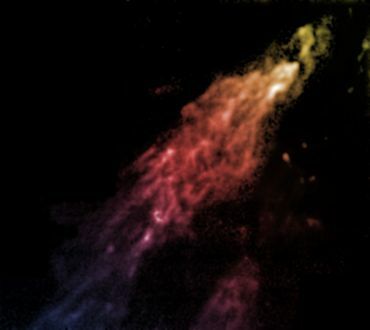 In 2006, a team of scientists (including Jürg Diemand, Michael Kuhlen, and Piero Madau) modelled the process by which dark matter "clouds" are attracted to form the Milky Way's dark halo (Diemand et al, 2006). They simulated the development and movement of 234 million "cloudlets" as they come together to form a dark halo about the same size as that around the Milky Way. 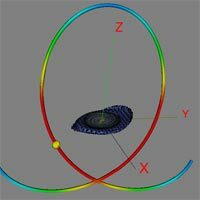 Their simulations show that there should be at least 10,000 separate "subhaloes" of dark matter within the overall galactic halo, each at least a few thousand light years across. Over time, a fair number of these galactic "seeds" should have attracted ordinary matter (mostly hydrogen and helium gas) to form star clusters. 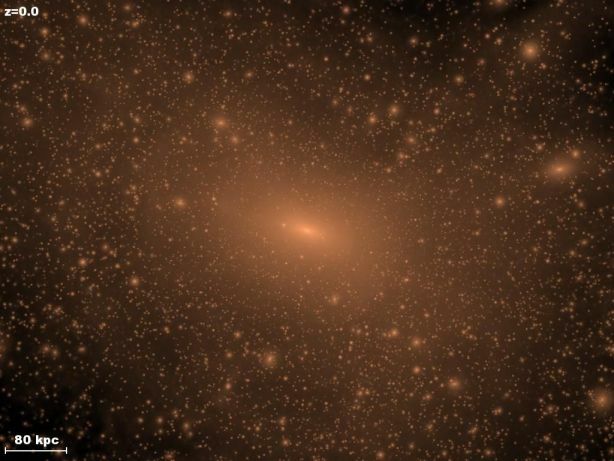 About 120 of the larger clumps of dark matter should have become large enough to have attracted enough gas to become dwarf galaxies, altough astronomers have identified about 15 dwarf satellite galaxies around the Milky Way thus far. It is possible that many subhaloes did not form dwarf galaxies because dark matter has some property that prevents it from forming dense clumps. For example, it might be unexpectedly hot, and therefore hard to compress. Many astronomers currently believe, however, that there are other explanations for the paucity of observed satellite companions around the Milky Way. It may be that most of the subhaloes were sterilized by ultraviolet light from the earliest stars, which heated up intergalactic gas so that that it has been more difficult for subhaloes to capture. In addition, supernova explosions may have blasted gas out of many early dwarf galaxies, halting their continued development. (More from Stephen Battersby, New Scientist, November 22, 2006; and Diemand et al, 2006). In November 2009, two astronomers revealed supporting evidence that Smith's Cloud may be surrounded by a massive dark halo. Astronomers have detected evidence that dwarf satellite galaxies are disturbing the cocoon of dark matter around the Milky Way and causing its disk to warp. In 1957, astronomers surveying galactic hydrogen gas discovered that the Milky Way is not flat but warped near its edges like a fedora hat, with one side of its spiral disk curving as much as 20,000 light years above the main galactic plane and the other dipping a little less below it. While some researchers suspected the warp was caused by the two Magellanic Clouds (nearby satellite galaxies that orbit the Milky Way every 1.5 billion years), subsequent calculations showed they alone were not massive enough to produce the disk's warp. 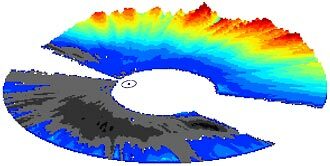 In January 2006, a team of researchers (including Leo Blitz, Martin Weinberg, Carl Heiles, and Evan Levine) announced finding evidence that the Magellanic Clouds can account for the warp but only because their motion around the Milky Way generates a powerful gravitational wake within the massive dark halo. 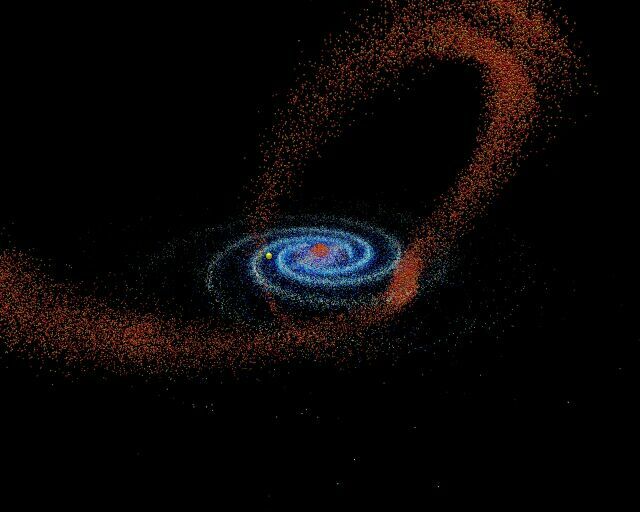 As the Magellanic Clouds orbit the Milky Way, computer simulations indicate that the galactic disk ripples over time and its edges ruffle "like a table cloth in the breeze" (U.C. Berkeley news release; and Maggie McKee, New Scientist, January 10, 2006). On January 9, 2007, astronomers announced that new measurements of the velocities of the Megallanic Clouds through space suggest that the Milky Way's combined dark and visible mass must be twice as much as originally thought if the Clouds are trully orbiting satellites of the galaxy (more). Warp in galactic hydrogen layer. galaxy's dark matter halo (more). 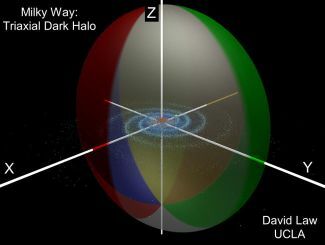 In January 2010, a team of astronomers (including David Law) announced at the 215th Meeting of the American Astronomical Society that the cloud of dark matter that surrounds our Milky Way galaxy appears to be shaped like a "squashed beach ball" that is oriented perpendicularly to the galaxy's spiral disk. 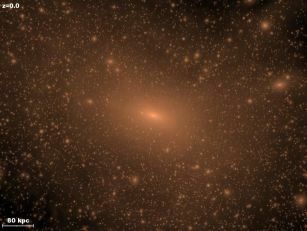 The team studied the path of a dwarf galaxy called the Sagittarius dwarf elliptical or spheroidal galaxy, whose stars have been "shredded" into a long tidal stream as the smaller galaxy was gravitationally drawn into a merger with the Milky Way beginning some three billion years ago. Their hypothesis is that the the gravitional pull of the Milky Way's immense halo of surrounding dark matter should have shaped the trajectory of the tidal stream of stars ripped from the Sagittarius galaxy as it was drawn in. is markeded by the yellow dot (more). Their study of this "debris" stream of stars suggests that the distribution of dark matter around the Milky Way is very different to that of the galaxy's stars and gas matter seen in luminous ordinary matter. Although computer simulations had suggested that the halo should mimick the Milky Way's spiral disk of stars, the team's results indicate that the dark halo is oriented roughly perpendicular to the disk and is distributed roughly half as thick as it is wide. (More discussion is available from Rachel Courtland, New Scientist, January 6, 2009, which includes a video animation describing the proposed shape and orientation of the Milky Way's dark matter; and David Law's description of his current research on Galactic Structure and Dynamics, being undertaken by studying the formation and evolution of tidal streams from Local Group of dwarf spheroidal galaxies). Astronomer Jürg Diemand maintains a web site (with Michael Kuhlen and Piero Madau) that provides more images, movies, and discussion on their model simulations of the formation of the dark matter halo around the Via Lactea ("Milky Way"). © 2006-2010 Sol Company. All Rights Reserved.